Skillet Fish Tacos with Avocado Crema are perfect for “taco Tuesday” or really any day of the week! 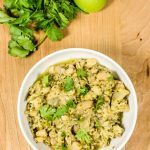 Quick to make, flavorful with every bite, and healthy! 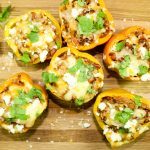 Weight Watchers friendly recipe- 4 SmartPoints! 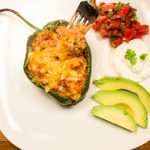 I love quick & easy meals… especially if they are Mexican inspired! As you may know, I am from Texas so all I crave is Mexican food. Mexican food was really the first type of food I learned how to cook when I started on my Weight Watcher journey. If I was going to be on a “diet”, I better be able to eat the food that I love! This is why I love Weight Watchers so much! Fish Tacos have to be one of my all-time favorite quick weeknight dinners to make if I’m really craving Mexican food. 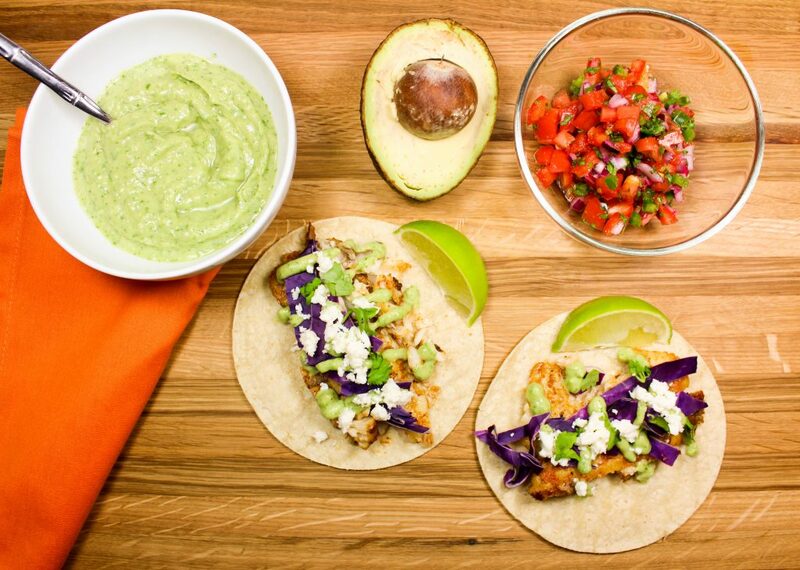 It takes little to no time to grill the fish and just a few minutes to assemble the tacos. My Skillet Fish Tacos with Avocado Crema are divine! Packed with amazing flavor. This is a Weight Watcher friendly recipe and 4 SmartPoints for TWO TACOS! I always keep frozen fish on hand so that I can have fish tacos whenever I want. I typically boast about how fresh is best, but frozen fish works just fine for this! We all need some short cuts when it comes to cooking. It’s actually more economical to buy a big bag of frozen fish than buying fresh fish. For this recipe I prefer to cook with tilapia; tilapia is a really light fish and cooks in just a few minutes. You could also use mahi mahi, flounder, or halibut. To really pack in the Mexican flavor into the fish, make a quick dry rub using chili powder, cumin, salt, and pepper. Rub each side of the fish with the spices and refrigerate for about 30 minutes to 1 hour. Add a little bit of oil to a cast iron skillet and heat over medium heat for a minute. Add the tilapia and cook on each side for about 5 minutes. You will know it’s time to flip the fish when it doesn’t stick to the pan (great cooking tip for basically anything you cook in a skillet!). Be gentle when flipping the fish… tilapia (and all fish previously mentioned) are really delicate so flip with caution! The fish cooks in no time so be sure to be ready to flip the fish. While the fish is the star of the star of the show (we are after all making fish tacos) the Avocado Crema is where it’s at. I LOVE a good sauce, especially in a taco! 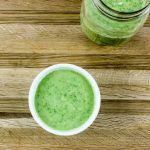 Avocado blended with Greek yogurt and cilantro… soooo creamy and delicious! While this fish is marinating in the fridge, make the sauce. To a food processor (or blender) add avocado, fat free Greek Yogurt, jalapeno, Mexican spices, cilantro, garlic, lime juice, and water. Blend until you get a creamy texture. You can add more water if you want to have a thinner sauce. 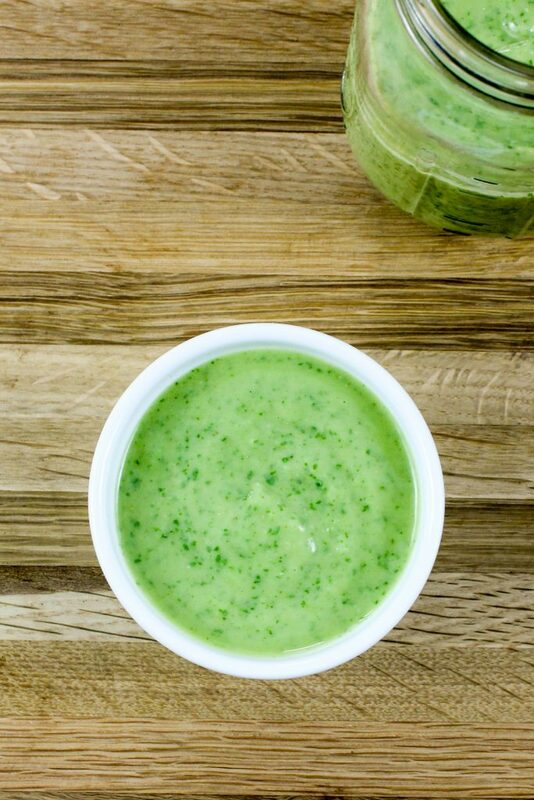 Click this link to get the full recipe for Quick & Easy Avocado Crema. I like to serve these tacos on corn tortillas topped with cilantro, fresh Pico de Gallo, red cabbage, queso fresco, a drizzle of Avocado Crema, and lime juice. Skillet Fish Tacos with Avocado Crema are perfect for “taco Tuesday” or really any day of the week! Quick to make, flavorful with every bite, and healthy! Rinse tilapia filets and pat dry. In small bowl, mix chili powder, cumin, salt, and pepper. Gently rub spice mix onto each side of tilapia filets. Put tilapia filets in a zip lock bag and marinate in refrigerator for 30 minutes to 1 hour. In a non-stick skillet, over medium-low heat warm up corn tortillas for 2 minutes on each side. Set aside for later. While fish is marinating, make the avocado crema. Add avocados, Greek yogurt, cumin, jalapeno, onion powder, cilantro, garlic, water, lime, and lime zest in a food processor (or blender). Mix will and refrigerate for later. Heat oil in a cast iron skillet over medium heat, cook tilapia each side of the tilapia for about 5 minutes. Cover fish with lime juice and cook for 1 more minute. Remove fish from skillet and gently cut fish into strips. On top of corn tortilla, add fish and top with shredded cabbage, avocado crema, fresh cilantro, lime juice and Queso fresco. 1 Tilapia filet will make 2-3 tacos. 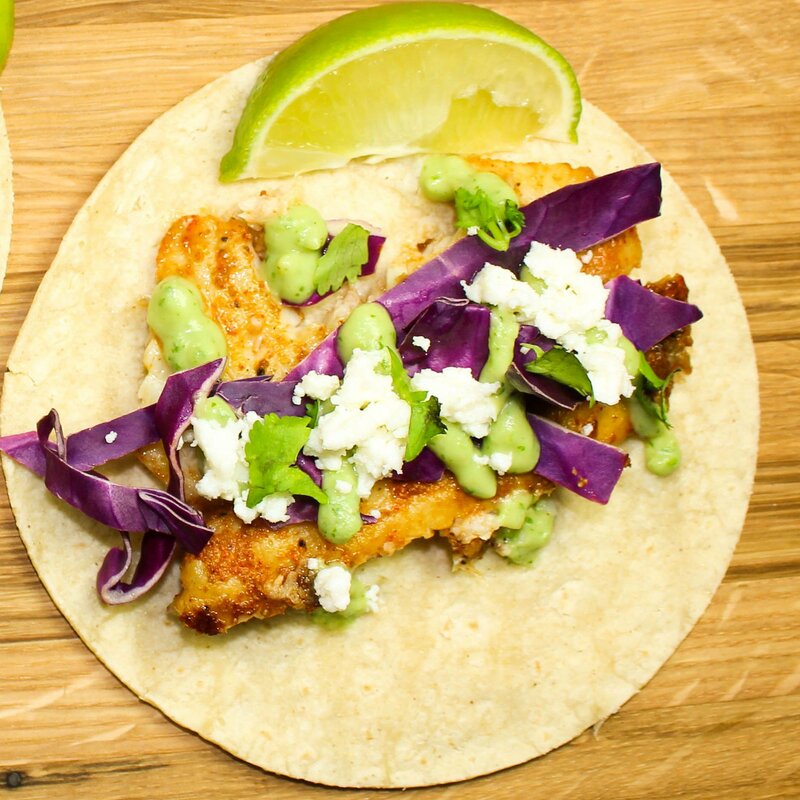 If you want to make more tacos, add 1 Tilapia filet to the recipe ingredients.